Sriracha buffalo boneless wings are mildly spicy, garlicky, saucy, and crunchy – just begging to be dipped in ranch or bleu cheese dressing! 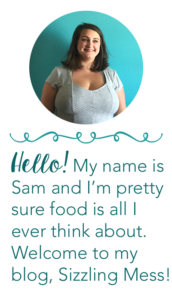 Before going gluten free, my favorite restaurant was probably Buffalo Wild Wings – I loved their saucy boneless wings, their crispy traditional wings, and their ultimate nachos were my jam. So, I’m definitely not giving any of that up just because I can’t have gluten, and neither should you! Enter homemade gluten free boneless wings! 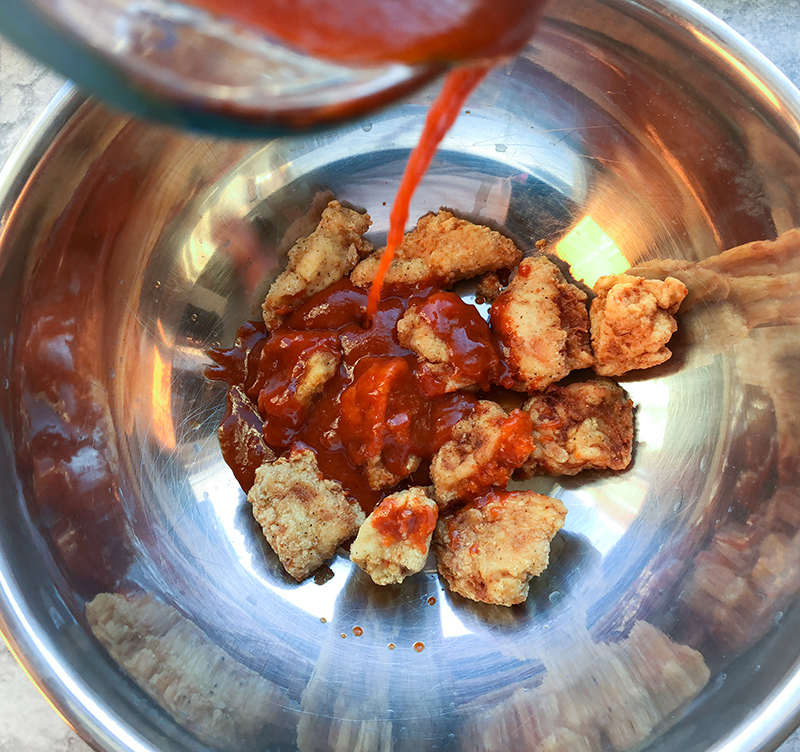 I was pretty confident testing this recipe out because I’ve had success with gluten free Nashville hot chicken strips – and I wasn’t disappointed! The best part is that I can experiment with the flavors I would want if I worked in the “sauce lab” at BWW, so it’s even better. I went with the parts of a traditional buffalo sauce, but replaced the Frank’s RedHot with Sriracha, and you guys, it’s so good! You definitely need to try it! Although, if you want to go with a more traditional buffalo, you can totally just use Frank’s (or any other hot sauce that you love – go crazy!). Being the definition of extra in human form, I also made a second flavor of wings which I will share on the blog later this week! I use Hidden Valley Ranch dry mix for my ranch dressing, and add a little sour cream in with the mayo and milk. I’ve tried to make my own restaurant-style ranch a million times, and every time I discover that the answer is Hidden Vally. Sorry not sorry. It’s gluten free! Not gluten free? You can substitute the gluten free flour for regular flour. 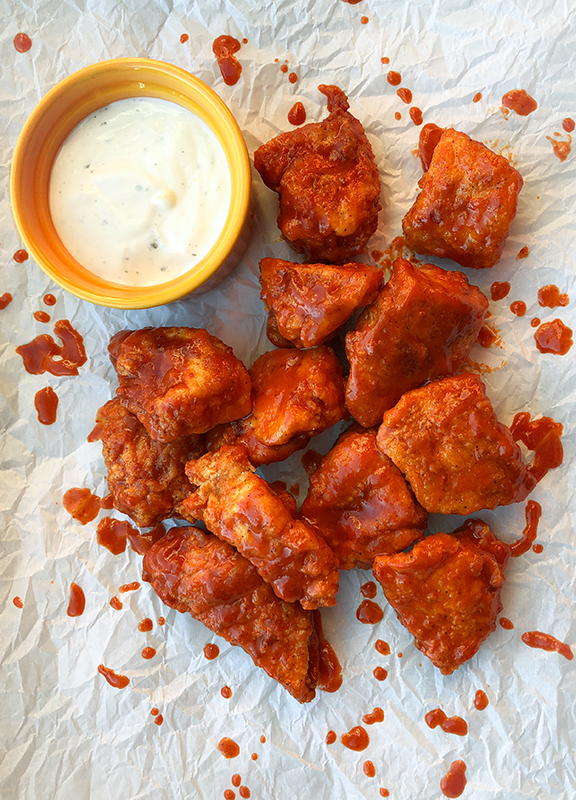 These crunchy gluten free boneless wings are packed with flavor and the perfect amount of spice, with a Sriracha buffalo sauce. In a small saucepan over medium heat, melt the butter. Once butter is melted, add sriracha, garlic powder, onion powder, cayenne pepper, and salt and whisk together thoroughly. Turn the heat to low, stirring occasionally but keeping warm (it will start to solidify if it cools, so if this happens, just re-heat and whisk vigorously), while you make the boneless wings. Heat about an inch of oil in a dutch oven, or heavy bottomed pan to 350 degrees F.
Set up your dredging station with chicken pieces, egg, and combine cornstarch, gluten free flour, salt, and pepper. One by one, dip chicken pieces in egg and then roll in flour mixture. Fry chicken pieces in batches (being careful not to overcrowd the pan), until the crust is golden and an instant read thermometer shows an internal temperature of 165 degrees F. Set aside to drain on paper towels. In a large bowl, toss boneless wings with sriracha buffalo sauce and serve with ranch or bleu cheese dressing for dipping! I like to use Bob's Red Mill Gluten Free All Purpose Baking Flour for this application (NOT Bob's Red Mill 1 to 1 Baking Flour), but any GF flour blend with no xanthin gum should work. Blends with xanthin gum may get sticky when fried. Not Gluten Free? You can substitute 1.5 cups all purpose flour for the GF flour blend and the cornstarch in this recipe. These sound and look SERIOUSLY divine! And they’re gluten free! Yay!! It’s so hard to find delicious premade gluten free wings (or chicken really of any kind). I’ve been quite disappointed with store bought. I can’t wait to make these. You’re speaking my language Michelle, hot and spicy is my thing. I remember when my wife introduced me to them about 8 years ago, I completely love it! 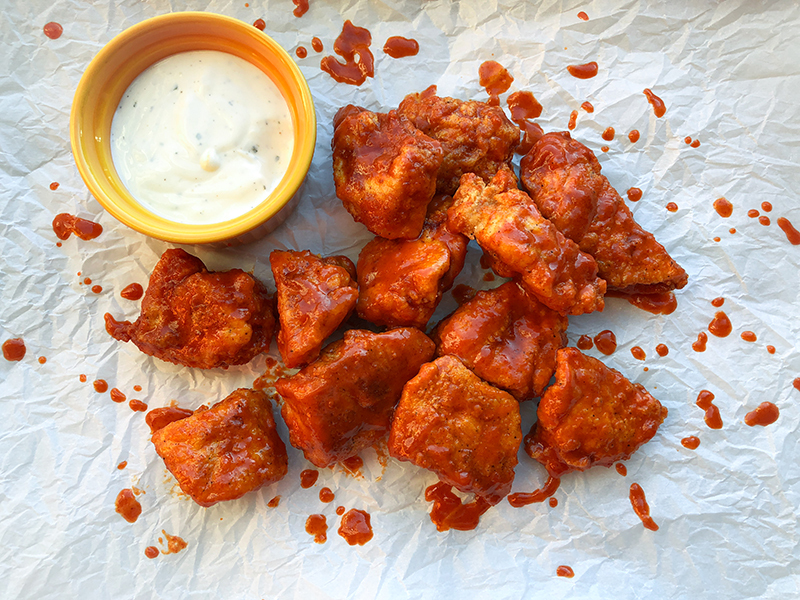 I Love anything with a little spice… particularly Buffalo sauce! These look wonderful! These looks so good! I love buffalo wings and the fact that these are gluten free make them a winner to me! These wings look like perfection!! I absolutely LOVE sriracha. Such a fun twist on classic wings. Also, I am totally with you on the ranch. Sometimes you have to leave things to the dressing professionals. Haha!